Have you ever wanted a older Brother that got along? a story about a kid in middle school with a older and younger brother. Rodrick is always mean to Greg (the main character).their parents leave for the weekend with his little brother many. after they become best brothers. What will they do home alone?! Im going to tell you about the book Dairy of a Wimpy Kid Rodrick Rules. 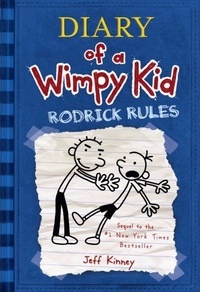 In this book theirs aa kid named Greg who has big brother named Rodrick who doesnt respect him at all. Only you can find out what happens. My favorite part is when his little brotter Manny draws a monster from a movie. I Recommend this book because its really funny so try it. Greg. Rodrick. Rowley. Fregley. Chirag. 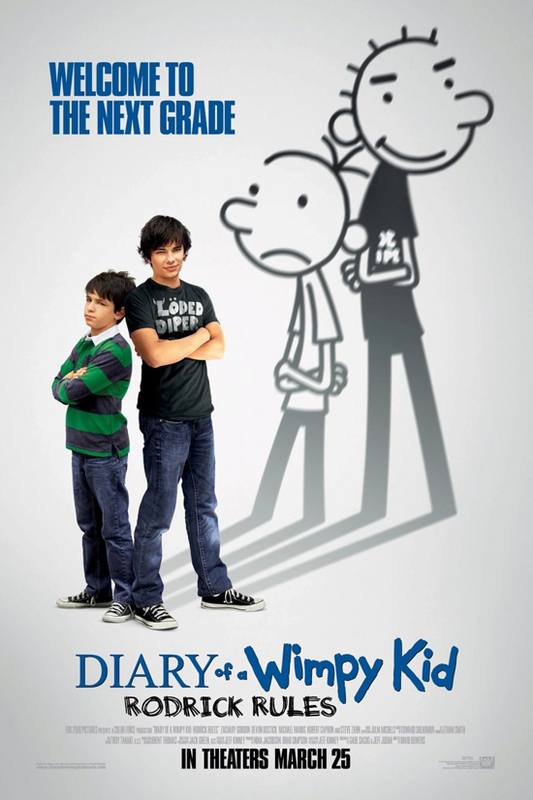 And, of course, that embarrassing diary… They’re all back in the new Diary of a Wimpy Kid movie, based on the book Rodrick Rules by Jeff Kinney. Have you seen the new Wimpy Kid movie? Leave a comment with YOUR review! How do you think it compared to the book and the earlier film? 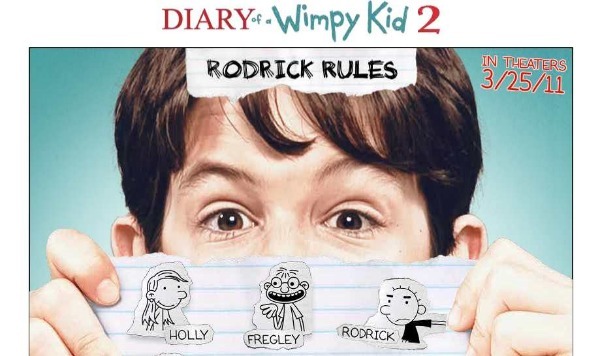 Wimpy Kid Sequel: Ready for “Rodrick Rules”? Zoo-Wee Mama! Know what tomorrow is? Well, yes, it is indeed Friday Friday Friday (and now I have that song in my head — get it out get it out get it out! )… But it’s ALSO the release date for the second Diary of a Wimpy Kid movie, Rodrick Rules! Straight from the source! Also from Scholastic, an interview with author Jeff Kinney reveals that he’s got at least two more Wimpy Kid books in the works, and probably another movie. Keep ’em coming! Just in time for April Fool’s! Apparently, Zachary Gordon (who plays Greg) and Devon Bostick (who plays Rodrick) are huge pranksters, and kept things lively on set. Zach dumped a whole mess of salt into one of Devon’s water bottles, and Devon tricked Zach into eating an Oreo filled with toothpaste instead of frosting! Author Jeff Kinney also got into the act when he pulled one over on Zach — watch the video of his prank on Cartoon Network (click “Behind the Scenes” on the left side, and then choose “Inflatable Extras” down below). Between the official site and Cartoon Network, there are about a bazillion more video clips for you to watch… or you could just wait until tomorrow and see the whole movie — that’s what Nancy and I are going to do! So check back next week for our review. For now, I’ll leave you with this hilarious video. I started this post by referring to a big YouTube sensation, so it’s only fitting to end with what very well may be the next big Internet hit. At least, I think it should be! And leave a comment if you’re planning to see the film! How do you think it will compare to the book? Unlike Rodrick, Karen never threw any parties when her parents were away. That they know of! Just kidding, she never did. She was a good kid. Really. Rodrick Rules (Diary of a Wimpy Kid #2) Movie Trailer! For the movie Rodrick Rules! Alright, maybe it’s a little early for Valentine’s Day poems. Definitely too early for a bad one. And I’m not sure why I even wrote the poem, since there’s no love between Greg Heffley and his older brother, Rodrick… which you know all about if you’ve already read Rodrick Rules, the second book in the Diary of a Wimpy Kid series by Jeff Kinney. Nancy’s excited to see what Karen thinks of the trailer, since Karen confessed that she thought Rodrick was kind of cute… Hee hee!